Auction # 1906 ARGENTINA: small February auction with very interesting lots! 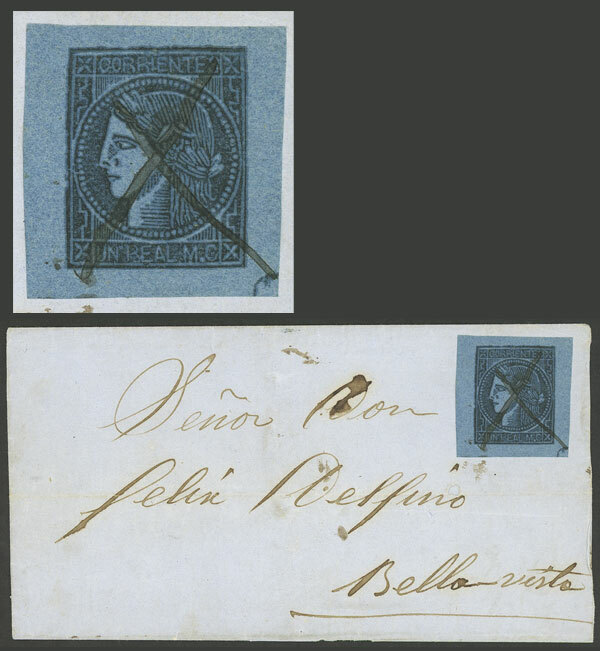 GJ.1c, translucent OILY IMPRESSION, type 2, huge margins, franking a folded cover dated EMPEDRADO 10/JUN/1857, superb. Entire or folded covers of the Province of Corrientes in which the origin and date of use can be reliably verified are rare, with Alberto Solari certificate. Lot 18 - Argentina corrientes - Guillermo Jalil - Philatino Auction # 1906 ARGENTINA: small February auction with very interesting lots! Lot 10 - Argentina corrientes - Guillermo Jalil - Philatino Auction # 1906 ARGENTINA: small February auction with very interesting lots! Lot 15 - Argentina corrientes - Guillermo Jalil - Philatino Auction # 1906 ARGENTINA: small February auction with very interesting lots! Lot 33 - Argentina corrientes - Guillermo Jalil - Philatino Auction # 1916 ARGENTINA: "Budget" auction with many good lots at VERY LOW STARTS! Lot 26 - Argentina corrientes - Guillermo Jalil - Philatino Auction # 1916 ARGENTINA: "Budget" auction with many good lots at VERY LOW STARTS! Lot 245 - Argentina general issues - Guillermo Jalil - Philatino Auction # 1916 ARGENTINA: "Budget" auction with many good lots at VERY LOW STARTS!